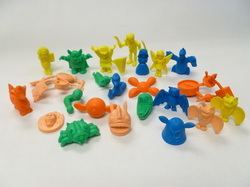 The largest variety of Zelda figures are some of the smallest. 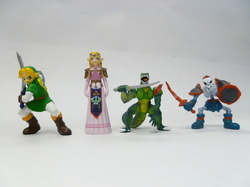 These figures cover several different Zelda game titles as well as a wide variety of characters. Characters: Link, Like Like (with dungeon key), Zol (with bow), Ghini, Zola, Wallmaster, Peahat, Armos, Vire, Moblin, Darknut, Dodongo, Wizzrobe, Tektite, Gibdo, Octorok, Digdogger, Leever (with boomerang), Gel (with potion), Boulder-Bomb combo, and Rupee-Ladder-Raft combo. Other Info: The set comes in five color options: Orange, Peach, Yellow, Green, and Blue. Characters: Link (with Triforce), Zelda, Ganon, Stone Statue, Gleeok Head, Gleeok, Pols Voice, Lanmola, Patra, Rope, Moldorm, Aquamentus, Fairy, Stalfos, Lynel, Bubble, Manhandla, Keese, Gohma, Blade Trap-Heart-Watch-Arrow-Flute combo, and Compass-Candle-Magical Rod-Book of Mudora combo. 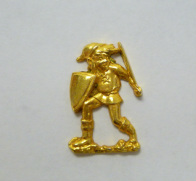 Other Info: Link is one of six figures that was released by Matinox in their 1994 Super Mario Bros. Series 6 line. These tiny porcelain figures are known as fèves. According to Epiphany-Figures.com, fèves are figures that are traditionally put into "King Cakes" (also known as "Epiphany Cakes.") King Cakes are eaten yearly on January 6th in celebration of the Christian holiday of Epiphany. Originally a bean was hidden in the cake. The person who finds the bean in their piece is named king for the day. Modern King Cakes now use porcelain or metal fèves instead of beans. Other Info: This gold colored figure was originally package with five other golden Nintendo Figures (Peach, Mario, Bowser, Luigi, and Tanooki Mario.) These tiny metal figures are known as fèves. According to Epiphany-Figures.com, fèves are figures that are traditionally put into "King Cakes" (also known as "Epiphany Cakes.") King Cakes are eaten yearly on January 6th in celebration of the Christian holiday of Epiphany. Originally a bean was hidden in the cake. The person who finds the bean in their piece is named king for the day. Modern King Cakes now use porcelain or metal fèves instead of beans. 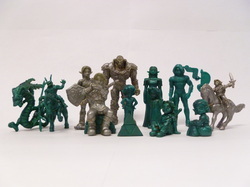 Characters: Adult Link (Standing), Adult Link (Sitting - with brick bench), Adult Link on Epona, Young Link, Adult Zelda (with Triforce), Young Zelda, Ganon, Phantom Ganon on Horse, Sheik, Saria, Malon, and Volvagia. Other Info: All of the figure were released in two color variations: Metallic Green and Silver. The current set that I own was once painted by its previous owner. I have taken some time to restore them to their original state, but there is still some color distortions. Hopefully, when I have some free time, they will undergo a second restoration, hopefully removing all of the paint entirely. Other Info: These set was available in four color variations: Fulled Colored, Gold, Silver, and Bronze. I own a Link figure only from the 'Battle with Morpha' set (Silver Edition), 'Battle with Morpha' (Color Editon), Young Link and Young Zelda (Color Edition), Adult Link and Volvagia (Silver Edition), Link on Epona (Color Edition), and Link on Epona (Silver Edition). Looking for: Link's Battle with Morpha (in silver, gold, and bronze), Young Link and Young Zelda (in silver, gold, and bronze), Young Link and Adult Link (in color, silver, gold, and bronze), and Adult Link and Volvagia (in color, gold, and bronze). See them in my Wish List! Other Info: Looking for Darunia, Princess Zelda, Young Link, and Sheik. See Wish List for complete set photo. 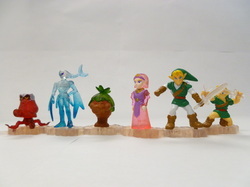 Other Info: The complete set has 5 figures featuring three characters: Tetra, Aryll, and Link. There are three variations of Link's facial expressions: Happy, Cautious, and Angry. The complete set also comes with several accessories, including: 3 shields, 3 swords, 4 rupees, a Tingle Tuner, a Telescope, and a bomb. Also, when you move the heads of these figures, the eyes appear to "move" in the opposite direction. Other Info: The standard set has 4 figures featuring Link in different colors: Red, Blue, Green, and Purple. There are three facial expression variations of each color of Link (Happy, Cautious, and Angry) resulting in a complete set of 12 figures. The set also comes with several accessories, including: 4 shields, 4 swords, 2 rupees, a bow, a fairy, and a bomb. Also, when you move the heads of these figures, the eyes appear to "move" in the opposite direction. 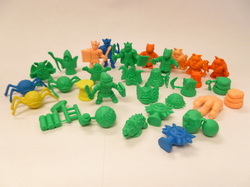 Other Info: There are 12 figures total in this set. 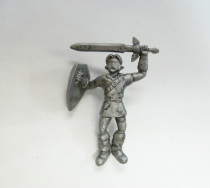 The special 12th figure is of Engineer Link, which I am still looking for to complete my set. (See Wish List). Originally sold individually packed in capsules in chocolate eggs. Normally imported as capsules with/without box. Other Info: This figure was released as part of World of Nintendo series, and has some (but minimal) posable features. Toon Link came with a removable shield accessory and an attached sword. This figure would be reprinted in the Jakks line, twice in an open 'blister' package (Series 1-2 and 1-3) (both of which are Walmart exclusives) and two more times as a carded figure for Series 1-3 and 1-4. The same pose would be replicated and miniaturized in the Microland and Microland Deluxe World of Nintendo series. Other Info: This figure was released as part of World of Nintendo series, and has some (but minimal) posable features. This figure was also repackaged and rereleased for Series 1-3. 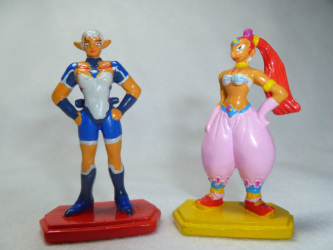 The same pose would be replicated and miniaturized in the Microland and Microland Deluxe World of Nintendo series as well as their 6" figure series. Other Info: This figure was released as part of World of Nintendo series, and has some (but minimal) posable features. Toon Link came with a removable shield accessory and an attached sword. This figure is a reprint in the Jakks line, as an open 'blister' package (Walmart exclusive) of the Series 1-2 2.5" Link. There are also two carded figures for Series 1-3 and 1-4 that are identical. There is also a another "blister reprint of Toon Link in the Blister 1-3 Series. The same pose would be replicated and miniaturized in the Microland and Microland Deluxe World of Nintendo series. Other Info: This figure was released as part of World of Nintendo series, and has some (but minimal) posable features. This figure would be reprinted with the carded 2.5" figures from Series 1-3 and 1-4. The same pose would be replicated and miniaturized in the Microland and Microland Deluxe World of Nintendo series. Other Info: This figure was released as part of World of Nintendo series, and has some (but minimal) posable features. Toon Link came with a removable shield accessory and an attached sword. This figure is the fourth reprint in the Jakks line, the first being a carded figure from Series 1-2, the second an open 'blister' package (Walmart exclusive), and the third a carded figure from Series 1-3. A fifth reprint would come in a second blister set from the Blister Series 1-3. The same pose would be replicated and miniaturized in the Microland and Microland Deluxe World of Nintendo series. Other Info: This figure was released as part of World of Nintendo series, and has some (but minimal) posable features. This figure is a reprint of the figure from the open 'blister' pack series that was a Walmart exclusive as well as the carded Series 1-3. The same pose would be replicated and miniaturized in the Microland and Microland Deluxe World of Nintendo series. Other Info: This figure was released as part of World of Nintendo series, and has some (but minimal) posable features. This figure would be reprinted with the carded 2.5" figure from Series 1-6. Other Info: This figure was released as part of World of Nintendo series, and has some (but minimal) posable features. This figure will have an altered reprint with Link sporting a red tunic rather than his classic green in the carded Series 1-6. Other Info: This figure was released as part of World of Nintendo series, and has some (but minimal) posable features.